My boyfriend husband had not previouly been a big fan of muesli nor had he however been satisfied from his breakfast past 9am! Once I convinced him to leave the land of Weetbix for home-made muesli he was forever thankful…. As with many recipes to be made in bulk, the initial cost to buy all the ingredients can be significant; though as I said above this recipe lasts for some time and these ingredients will stay happily in your pantry for months. This way you have then on hand, ready to be grabbed when you make your next batch of muesli. The only ingredient I buy regularly is the oats themselves. Muesli in packets is like most food found that way; processed. Along with the yummy things your body wants and needs, you also often get some not-so-yummy things, and in my opinion totally unnecessary ingredients. Oil is #1 on this list in the packet-muesli world. Years ago I religiously bought (and enjoyed) a well known and popular Australian muesli brand – Carman’s. There are loads of brands like this that although making wonderful products with good quality ingredients they almost always contain unnecessary ingredients such as excess sugar in the form of honey and large quantities dried fruit as well as vegetable oil. 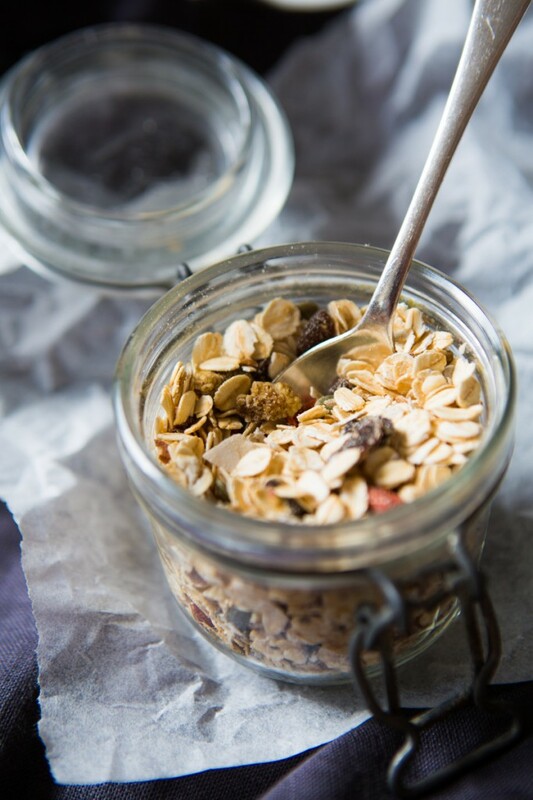 Like everything you make yourself, you know exactly whats going into it and can control the quantities as well; in the case of muesli I love the flexibility of alternating my seed and nut mix. Price is another crucial factor with 500g of a high quality off-the-shelf product costing between $AU6-10. The below recipe is nowhere near that in cost and is far more fabulous being made by your own hands anyhow…. Enjoy this recipe and know that you’ve done your body some serious good for the day. Any ingredient where you may prefer an alternative can of course be swapped out though the key to this particular recipe is about having no added sugars (this includes honey) as I feel it’s unnecessary. The recipe is deliciously sweet without it and this also extends to limiting the quantity of dried fruit. You could use dried apricots instead of sultanas and switch up your nuts as well, if you only have almonds then go with that! Serve with clean Greek yoghurt (and/or your choice of milk if you prefer) and yummy fresh fruit + cinnamon sprinkled on top! Alternatively you could use it as a base for this orange bircher muesli recipe. 18 Responses to "Killer muesli"
Very nice indeed. We have been making our own muesli for a long time now. I posted about it in January. Have a look here: http://wp.me/p1NUXa-Oy. Great post Conor and thanks for your compliment! I made this yesterday and we enjoyed it this morning with sliced banana and low fat milk! But I did double the chia seeds and why so few Nadia? Hi! I did this yesterday, but the sultanas turned out dry… any advice? Hi Tatiana and go you! This recipe transformed my life and made eating well so simple with a delicious + nutritious recipe just ready and waiting for me in the AM! I can’t say this has happened to me before however as the recipe is ‘dry’ baked, the ingredients will shrivel somewhat. When you bite into the sultanas, are they crunchy or still soft/chewy? If the latter, then all good and if crunchy, I’d leave them out of the baking process and add int afterwards. Hi Nadia, just wondering why the natural muesli mixture has to go in the oven?